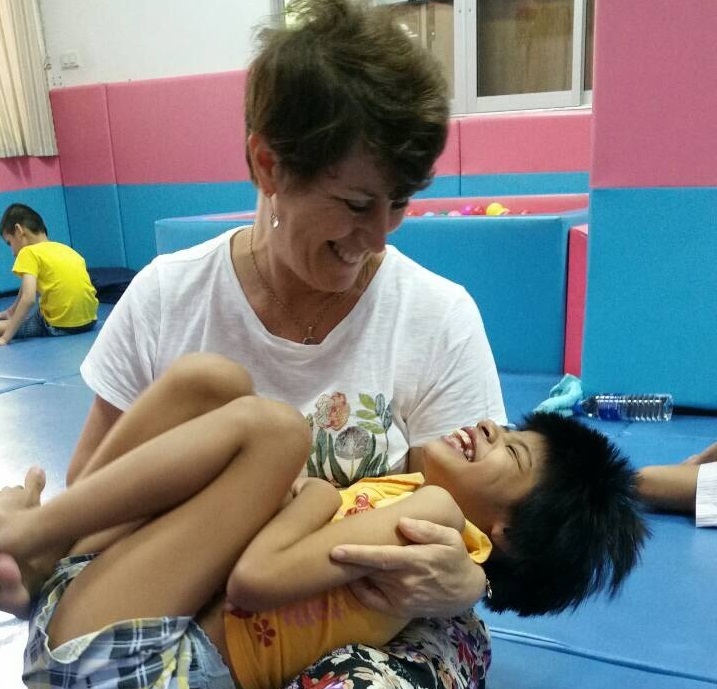 Help Eleni take her team of Therapists to Bangkok, Thailand, to work with the Christian Foundation for the Blind to heal over 4000 blind and disabled children. In September 2015 we created an alliance with the Christian Foundation for the Blind (or the CFBT) in Bangkok, Thailand. The CFBT runs nine schools that supports more than 4000 blind children and young adults with education, accommodation, life skills and job placement assistance. Most of the children at these CFBT schools suffer from more than just blindness. Some are unable to speak and respond to work the teachers are trying to do. many have Cerebral Palsy or other undiagnosed physical deformities and are confined to wheelchairs, if there is funding available, otherwise they are placed in one spot in the morning, and that is where they stay for most of the day. There are children with genetic or intellectual impairments, such as Downs Syndrome or Autism, and there is very little communication with these children, who have been left in these schools by their families who view their impairments as a curse and are very superstitious about the bad karma that these children will invoke on them and their villages. Along with Eaw Petchngam, one of our local therapists in Thailand, in September last year Eleni met with the founder and the head teachers of Ban Dek Ramindra, the principal school of the CFBT, as well as with a social worker and medical doctor to discuss implementing change within the school environment to improve communication between the teachers and students. While the teachers were very competent in their skillset and carried out their roles dutifully, the relationship the teachers seemed to have with the students lacked a sense of soul and nurture. Eaw and Eleni worked with the teachers on developing more of a connection with the students, demonstrating aspects of ES Healing and providing suggestions of maintaining this work with the children on an ongoing basis. In October and November this year (2016) we want to return to Bangkok, and take with us eight other Oasis Foundation therapists, including Eaw’s sister, Audy, to work with the CFBT. We would like to reinforce the work that we started with the teachers of the principal school, Ban Dek Ramindra, with further ES Healing training, and then extend our work by placing two therapists in each of the other eight CFBT schools, to treat the children and train their teachers for at least two weeks, but ideally a month or two if we can obtain sufficient funding. Our mission is to empower these children, through our ES Healing practices, to discover their greatest potential and live it joyfully. While we are unable to cure their blindness, we can assist them with their mobility, their flexibility and their ability to communicate, improving their overall wellbeing in a holistic manner, and bestowing upon them the gift of a greater awareness. With this awareness of who they are and the greater world in which they exist, we will be giving these precious children the power to invoke change. As a generation, it is our belief, the children of this Earth, even those who were born into a seemingly hopeless circumstance may just be able to work collectively to break the cycles of sickness and poverty and change the World as we know it. So, we are appealing to you. To carry out this work, we need funds. Will you help?